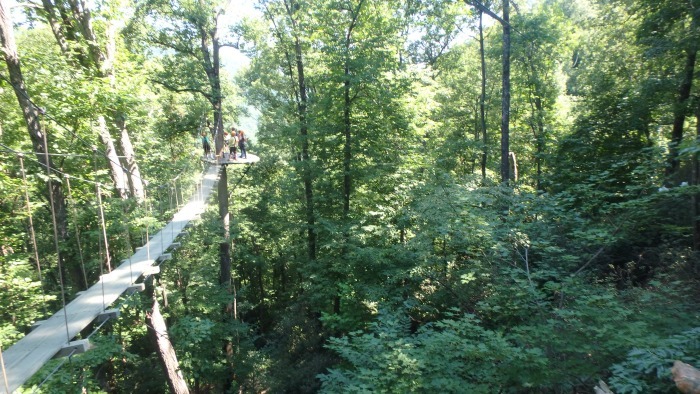 I thought the novelty of ziplining had worn off on me until I went to The Gorge Zipline in Saluda, NC. 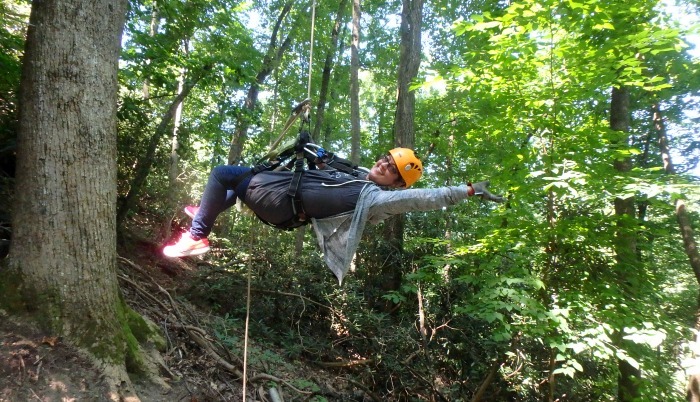 It’s the fastest and steepest zipline in the United States, and on a recent Hendersonville media tour I experienced exactly how thrilling it was! The Gorge Zipline traverses the Green River Gorge and drops 1,100 feet in elevation over the course of 11 ziplines, a sky bridge and 3 rappels, and it’s the most exciting zip experience I’ve ever had. Get yourself to North Carolina pronto, folks. It’s worth it! After a thorough training and practice run, we began our 3 1/2 hour adventure at the first zip line. Fair warning: there’s no easing into the speed at The Gorge and even though I’d been warned that the first run was fast, it nearly took my breath away when I started flying across the cable. The first three ziplines feel the fastest, but the longest zips are yet to come… nearly twice as long. If you allow yourself to look around while zipping, you’ll catch stunning views of the mountains and forest as you soar through the canopy. Because the zipline course is designed for speed, it’s also designed to help you slow down and stop safely, and you don’t need to use your hands for self-braking. Automatic zipstops do the braking for you. 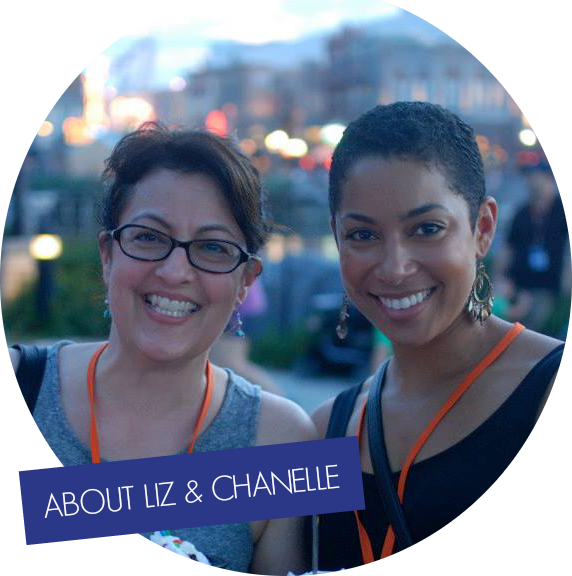 If you’ve never experienced zipstops before, they take some getting used to, but they are fabulous! Unless you weigh 250 pounds, you’ll likely stop a few feet from the platform and need to pull yourself in backwards with a hand-over-hand sloth-like action. The lighter you are, the further from the platform you’ll be, and although it’s not difficult to pull yourself in, you may very well feel it in your upper arm muscles the next day. I sure did! After zipping a few runs, you’ll cross the swinging bridge. It’s pretty wiggly but you’re safely harnessed the whole time, so don’t worry! You’ll also be rappelling three times, but if the thought makes you nervous, you need not be. It’s actually more like you’re being lowered to the ground than anything else. Our group was led by two exceptional guides (Christian and Brett) and they made the experience all the more fun and memorable. They were upbeat, humorous, encouraging and very safety-conscious, and they also shared some fascinating stories about how the zipline was constructed and about the area’s flora and fauna. 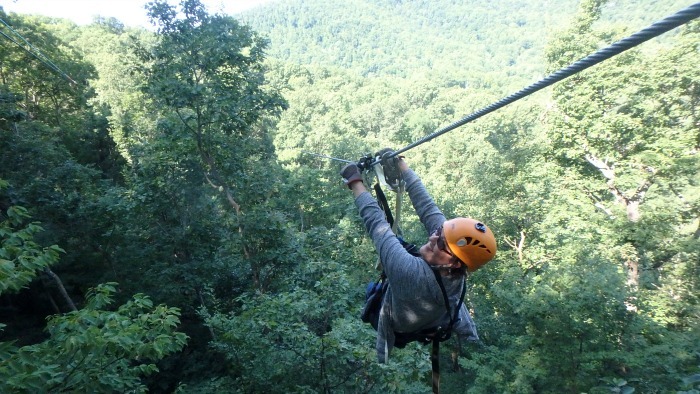 If you love adventure, you will love The Gorge Zipline. I promise you! No cameras or phones are allowed on the course, but the guides take fantastic photos along the way for you. Don’t leave anything in your pockets, and leave your car keys in the office. If you drop something, there’s no way to get it back and that’s not a risk worth taking. Once you’ve finished the aerial course, you’ll take a short hike to the van pick-up spot (water available) where you’ll be transported back to the top. Once there, you can see the photos the guides took, use the restroom, visit the gift shop and be on your way. 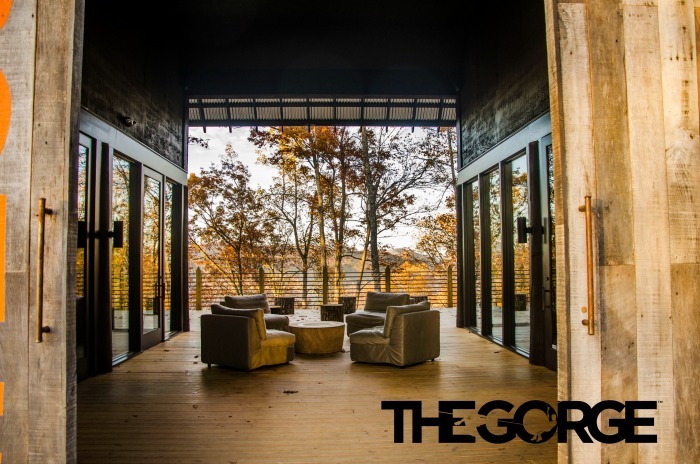 Visit the website for more information and check out VisitHendersonvilleNC.org for ideas on where to stay, eat and play while in the area. I love zip lining. It is so much fun and that area is just absolutely gorgeous! We have done some ziplining. But this one looks really thrilling. The location of the adventure is so important and this looks like an excellent locale to really enjoy your ziplining experience. I went ziplining when I was in South Africa. It was one of the most terrifying experiences of my life. Soooo afraid of heights. i would love to do this! i’m sure my husband would too. i’ll have to show him. i’m scared of heights, but this looks like a lot of fun. I would def be open to trying this if given the chance. It sounds like we need to make a trip! This looks like it would be a blast! My kids would love to go there! They will love the adventure and the thrill of being that high up on a zip line. We will have to visit next summer. I am adding The Gorge to our 2018 Summer Get-aways. I have never been zip linging but have heard it is fun. Not sure i could handle this one, It does sound exciting. I have always wanted to go Zip Lining! This looks like all sorts of crazy and all sorts of fun! How thrilling! I must remember to make time and try The Gorge’s zip lines if and when I am in NC. I can only assume that the views are fantastic! I have always wanted to try zip lining but I chicken out every time. No amount of prodding or convincing would make me agree to be connected to a cable way far up from the ground. Maybe I will, someday, but I will try the “kiddie” ones first. The Gorge Zip Line would be a great place for my adventurous sons. I will let them know. Love your adventurous spirit! That looks like so much fun! I’ve never been ziplining but I need to! Wow! This is truly exciting and something that I’d love to experience at least once in my life. It’s good to know that we have one on North Carolina! I would love to try this someday soon. Wow! Looks so fun and scary all at the same time. I think I would give it a try, I know my husband would for sure. Wow…that looks incredible! I’m a little scared of heights, but since you are securely harnessed in I could see myself going for it! What with all that breathtaking scenery and all -I’ve been to Charlotte, Cherokee and a few other NC towns and gotten to see some great sights. I have to go there in my next vacations!! I want to try the zip lining! It looks scary but funny! What a thrill!! I love things like this! I would love to try it out, it sounds so amazing! What a great trip! I’ve tried zipline in Tagaytay. At first, I was nervous then it was fun. I screamed and laugh until the end. That looks fantastic! Omg I am terrified and exhilarated by the thought of this! I’ve only done a very short zip line once, but I would love to go back and do a longer one some day. The Gorge Zipline looks exhilarating. Definitely a must do for thrill seekers in the area! My family and I are all about adventures! This looks something that we would definitely enjoy! Especially my oldest daughter, she’s all about ziplining lately! 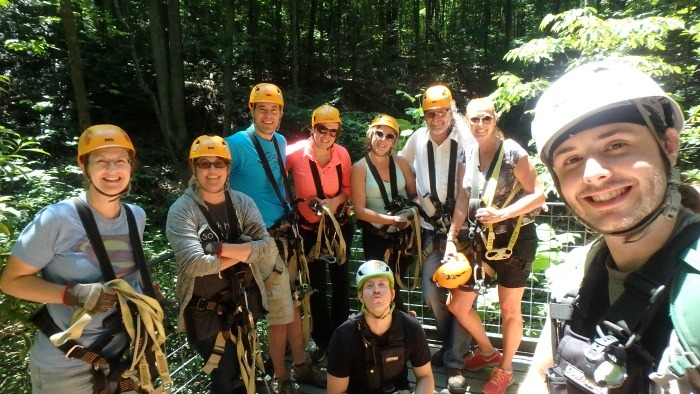 I’ve only zip lined in Canada on vacation- who knew there was a zipline like this in NC? Just one more thing to do when I visit the family! I have always wanted to try a zipline. The Gorge Zipline in Saluda, NC looks perfect for my first try. I am hoping to be in the area this fall. I’M getting wimpier and wimper the older I get but man this looks so awesome. I’ve loved ziplines since my parents put one off our backyard 2nd story deck – but I don’t think I could do this one. That is almost too high for me :/ I wish heights didn’t bother me so much. That looks like so much fun. I have always wanted to go zip lining. I hope that someday I’ll get the chance to go as well. I think this would be an awesome zipline to try. We’ve tried a treetop canopy one before and we’re always looking for new ones to try. I’ve done some interesting things on vacations and zip lining is on my bucket list. This looks like a great place too! This looks like so much fun! I totally need to try it some day when I lose some weight! This sounds like so much fun. My daughter would love to experience The Gorge. I’ve never actually been ziplining before! But it looks so much fun and adventurous! 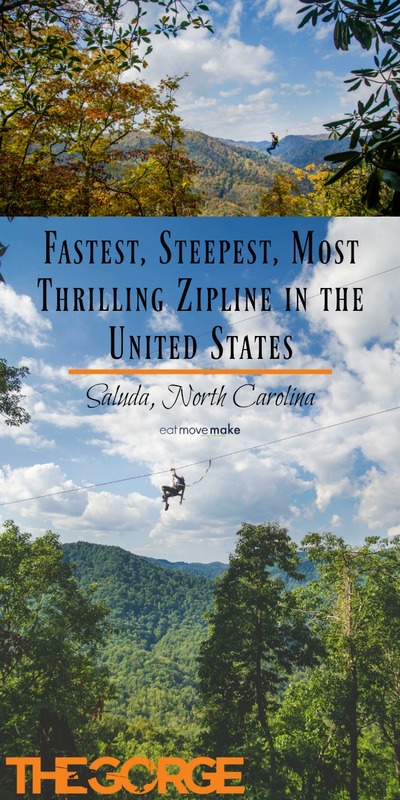 The Gorge Zipline in Saluda looks like an amazingly thrilling experience. I am not sure if I would be brave enough to try it anymore! Oh my goodness, what fun! I have never been zip lining. Looks like so much fun! I am dying to go ziplining! We also really want to plan a trip to North Carolina so maybe I can make it happen! Reading this I got a funny feeling in my stomach. I have sworn off roller coasters and this looks much more scary. I know if I was there I would venture up there but I am ok with solid ground where I am. I’ve never done a zipline. I’d be too nervous the line would snap! My son has done a bunch of zip lines all over the world. I will have to ask him about this one and see what he thinks. I’m always game for a zipline adventure. This are long ones and also has excellent views. Oh wow this looks absolutely amazing, I would have loved to have done this once upon a time it sounds like such a fun and exhilarating experience. That sounds like it’s a very scenic adventure! I have only been ziplining once, I did have a blast and would love to go again at a place like this. I have always wanted to go zip lining but always chicken out at the last minute! Looks like a lot of fun! You are a lot braver than I! It looks like a beautiful setting for a zipline though. I think it’s great that they take pictures for you. Oh my gosh! I need to do this! I love zip lining! I am totally adding this to my travel list! SUCH a beautiful place to have a zip ling too! This would be a blast! I’ve been wanting to go zip lining for a long time. I’m terrified of heights, but I think I could handle this okay. I am so happy to see this in pictures on your site! Cause I would never be that brave! Thanks for sharing, this looks like great fun for those who are not cowards like me! I never realized that the fastest zip line was only a couple hours away! We’ve been talking about things to do during the fall and this is going on my must-do list. I know the family will love it. I’m bookmarking this post so I can keep it handy. That looks like so much fun! I love zip lines. They’re the best way to view almost anything in my opinion, and even though I am terrified of things like roller coasters, I always feel so safe on a zip line. I’d love to do this. That sounds absolutely amazing. I have always wanted to go zip lining and that looks like an awesome place to do it.